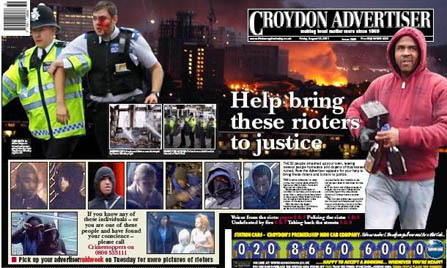 A local newspaper reporter has told of how he was punched and kicked in the face when he got caught up in the riots in Croydon. Gareth, who spent a ten hours in the thick of the riots, said a group of youths who had looted a shop became suspicous of his colleague and threw bottles at his head:. “Before I could respond I had been backed into a corner and punched in the face. I attempted to run but one of the masked attackers grabbed my hood and dragged my head back and then, thud I had been kicked in the jaw. Gareth then went home, cleaned himself up and went back into Croydon were the situation had worsened with youths as young as ten pelting police with bottles and bricks. He then witnessed one of the darkest moments in the town’s history when landmark furniture shop House of Reeves furniture was set alight, spreading to neighbouring flats where families were still inside. He has written about his experience in today’s edition of the paper which features a 20-page souvenir edition on the riots, with a different wrap covering the front and back pages of each of the paper’s four editions. Inside are eye-witness accounts from Gareth, Ross Lidbetter and Joanna Till, and photographs taken by Grant Melton and David Berman. The news teams also included Nikki Jarvis, Ian Austen, Rachel Millard and Chris Ballinger. Advertiser editor Glenn Ebrey said: “I cannot emphasise how committed, hard-working and, in Monday night’s case, brave our reporting team have been over the past few days. They have been a credit to their profession. The Advertiser’s website – www.thisiscroydontoday.co.uk – broke all the news as it happened throughout the week, with updates until 3am on Tuesday resulting in 40,000 page hits in a single morning. In Gloucester, The Gloucester Citizen received a record 1.1 million page views and 129,000 unique visitors in a 20-hour period on Wednesday. Good work Team Croydon. Great coverage on the night and a superb paper today! Two pages of a reporter’s account of the riots? Hang on, isn’t that his job?! Just report the news, I don’t want to know how you felt! Pendant, you may not want to know how he felt while there. But I was following his tweets as he reported direct from the riot. He never once told us how he felt, despite our concern for him. I can only thank him for risking his life to report on what was happening as it allowed me the knowledge to know if we were safe at our home as we live extremely close the town centre as do a number of my friends. Well done Gareth and the team. Looks like a fine job all round to me. I am sure you will all be rewarded in the usual way, as a cynical old pal of mine used to say! Nice work Gareth and the rest of the Croydon Ad team. The pages I’ve seen so far look fantastic. Risking his life? Have a word! And if he was, then he’s an even worse reporter than he himself claims! Too cynical, Pedant. The reporters did a great job in difficult circumstances. Be big enough to admit it. Just to make it clear, I am not that Pedant (but we must meet up for a drink). But who the **** subbed the HTFP story? Were was the real sub when needed? If you read the article its not actually that much about how the reporter felt, more about what happened. He was the only journalist in a position to see a lot of what he has described. If that’s the way the paper chooses to report it (and to be fair, there’s loads more ‘traditional’ stories about the riots) then fair enough. Why can’t there be some feature-style colour reporting included in a 20 page supplement, which presumably also included factual reports? If the colour comes directly from the journalist because they were among those directly affected by what happened then what exactly is wrong with that? I’m sure they spoke to many other people also affected by the riots and included that in the supplement as well. I’d be surprised if anyone can do anything right in your eyes Pedant. Sneering at what seems to be a good job in difficult circumstances is a little bit sad.